UPDATE 11:20PM CDT: Tom Petty has died, his longtime manager Tony Dimitriades has confirmed. Rock star Tom Petty died at the age of 66 after suffering a cardiac arrest at his California home. We’re sending our prayers and best wishes to Tom Petty and his family at this difficult time. First reported by TMZ, the rock legend was rushed to the hospital on Sunday night after suffering a “full cardiac arrest.” The LAPD confirmed the singer was taken off life support. TMZ reported that Tom Petty was found Sunday evening, October 1, at his Malibu, California home, “unconscious, not breathing and in full cardiac arrest”. 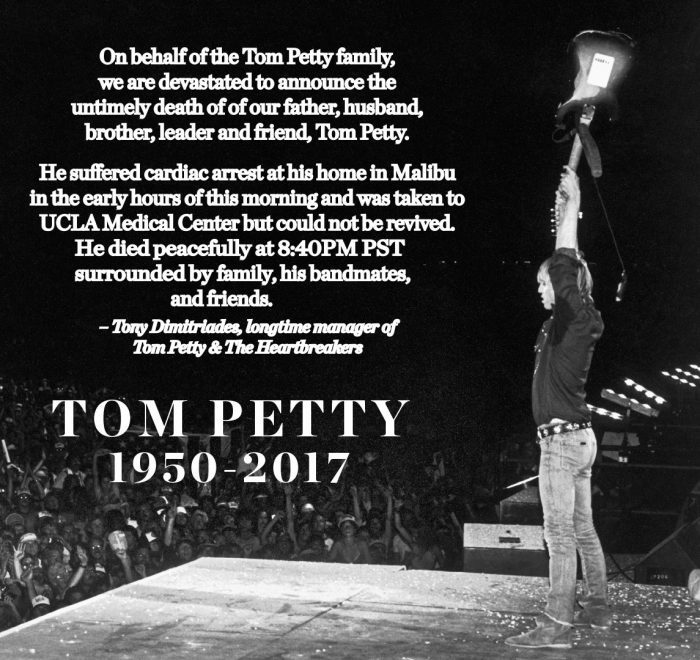 Petty just ended a huge North American 40th Anniversary tour, concluding at the Hollywood Bowl in California on Monday, September 25. Petty was 66 years old.